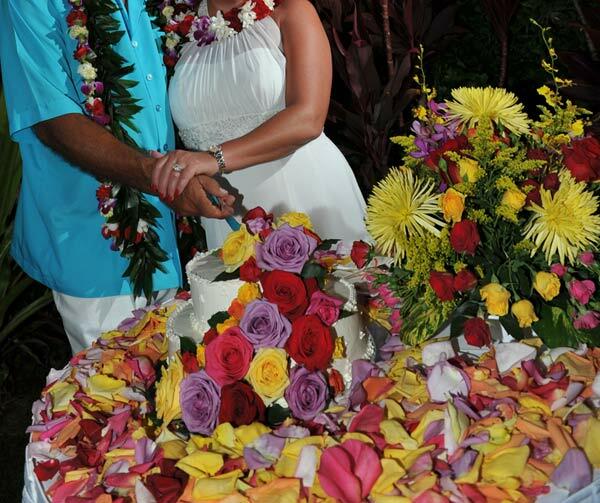 Your Maui wedding doesn’t end with the ceremony. Fukushima Flowers will carry your wedding theme to the reception celebrations. We work closely with the couple to reflect your personality and the mood you want to create, from wild and fun “bling” to subdued elegance. We will make your wedding reception decorations beautiful and reflective of your style. Table centerpieces are emphasized here. But we can expand the décor to other floral bouquets, wedding favors, flowers on your wedding cake and more.